Aspirit medium is a person who has become qualified in some special way to form a link between the living and the dead. Through the physical agency of the medium, the spirits of the deceased may speak to their family and friends and relay messages of comfort, support, and personal information. While some mediums gain impressions from the spirit world in a fully conscious state, others place themselves into a trance, which is often accompanied by manifestations that appear to defy known physical laws, such as moving objects without touching them, levitating the mediums' own body, and materializing spirit forms of the deceased. The essential attribute that qualifies one to be a medium is an extreme or abnormal sensitivity which seemingly allows the spirits more easily to control the individual's psyche. For this reason, mediums are often referred to as "sensitives." 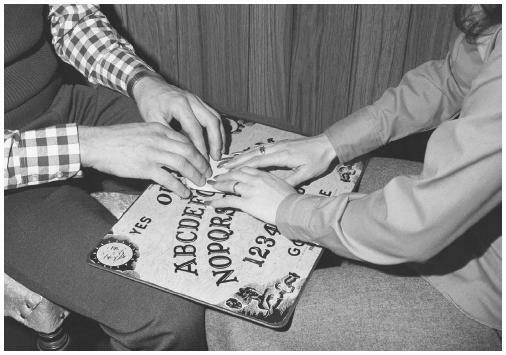 During seances, spirit mediums, often working in a trance state, claim to be under the direction of a spirit control or spirit guide that serves as an intermediary between themselves and the spirits of deceased men and women. Once contact has been made with particular spirits in the other world, the guide speaks through the medium and relays messages to the sitters, those men and women who have assembled in the seance room for the opportunity of hearing words of comfort or guidance from their departed loved ones. Spirit mediums argue that while Christianity, Judaism, and Islam promise their followers a life eternal whose reality must be taken on faith alone, for thousands of years those who visit mediums have been able to base their hope for a life beyond the grave on the tangible evidence provided by the phenomena provided in the seance room. Although they have been condemned as cultists, scorned as satanists, and reprimanded for communing with evil spirits by most of the major religions, mediums have remained thick-skinned toward their critics among the various clergy. In addition to any religious objections one might have toward the kind of evidence that spirit mediums present as proof of life after death, an important factor that has long contributed to the layperson's skepticism toward mediums is the fact that few areas of human relationships are so open to cruel deceptions. It has taken neither scientific training nor orthodox religious views to expose many spirit mediums as charlatans preying upon such human emotions as grief and sorrow over the loss of a loved one. Beginning in the latter decades of the nineteenth century, Spiritualists and spirit mediums began to contend with an increasingly materialistic and mechanistic science that did a great deal to obliterate the idea of a soul and the duality of mind and body. The concept of an eternal soul was being steadily eroded by an emphasis on brain cells, conditioned responses, and memory patterns that could exist only while the body remained alive. When the British Society for Psychical Research (BSPR) was established in 1882 and the American Society for Psychical Research (ASPR) was formed in 1885, leading spirit mediums such as Florence Cook (1856–1904), Mina "Margery" Crandon (1888–1941), Leonora E. Piper (1857–1950), and DanielDunglas Home (1833–1886) allowed themselves to be subjected to extensive tests conducted by psychical researchers, most of whom at least believed that man and mind were something more than physical things. However, as the experiments progressed year after year with spirit guides, materialized beings, and levitated objects, the researchers came more to believe in the enormous reach and abilities of the human psyche. They began to see the medium's spirit control as evidence that the human mind was capable of projecting a segment of itself unhampered by time and space, that one level of mind might be able to give "birth" to new personalities, that one level of the subconscious might telepathically gain knowledge of a departed individual from a sitter's memories while yet another level dramatized that knowledge into an imitation of the deceased's voice. In other words, the more the psychical researchers learned about the range and power of the human mind, the less credence they tended to grant to the spirit medium's "proof" of survival. Spirit mediums have never felt that the phenomena of the seance room can be properly or fairly transferred to the sterile environment of the laboratory with any degree of success. In answering the criticism that spiritistic phenomena cannot be repeated again under individually controlled conditions as demanded of a scientific experiment, Maurice Barbanell (1902–1981) wrote in This Is Spiritualism (1966) that such was not possible "because mediumship involves the use of human beings. Whenever you deal with human beings, the human factor can be wayward and liable to upset the most intricate calculations." Sometime in the 1940s, Dr. J. B. Rhine (1895–1980) summarized the research on survival evidence provided by spirit mediums in the laboratory to be a draw. While hardly anyone would claim that all the investigations conducted by psychical researchers since the 1880s could disprove the claim that "if a man shall die he shall in some manner or other be capable of living again," Rhine stated, "On the other hand, no serious scientific student of the field of investigation could say that a clear, defensible, scientific confrontation has been reached." However, in March of 2001, scientists involved in a unique study of spirit mediums at the University of Arizona announced that their findings were so extraordinary that they raised fundamental questions about the survival of human consciousness after death. Professor Gary Schwartz, who led the team of researchers, concluded that highly skilled spirit mediums were able to deal directly with the dead, rather than merely with the minds of the sitters. In the opinion of the scientists, all the data they gathered was "consistently in accord with survival of consciousness after death." Based on all their data to date, Schwartz said, "The most parsimonious explanation is that the mediums are in direct communication with the deceased." Gaynor, Frank, ed. Dictionary of Mysticism. New York: Philosophical Library, 1953. Paranormal News. http://paranormal.about.com/science/paranormal/library/blnews.htm. 1 October 2001. Skeptics Dictionary. http://skepdic.com. 1 October 2001. Garrett, Eileen. Many Voices: The Autobiography of a Medium. New York: G. P. Putnam's Sons, 1968. Hart, Hornell. The Enigma of Survival. London: Rider & Co., 1959. Matthews, Robert. Scientists Becoming Believers in Spiritualists' Paranormal Powers. http://www.telegraph.co.uk. 6 March 2001. Rhine, Louisa E. ESP in Life and Lab: Tracing Hidden Channels. New York: Collier-Macmillan, 1969. Smith, Alson J. Immortality: The Scientific Evidence. New York: Prentice Hall, 1954. Barbanell, Maurice. Spiritualism Today. London: Her bert Jenkins, 1969. Bayless, Raymond. The Other Side of Death. New Hyde Park, N.Y.: University Books, 1971. Uphoff, Walter and Mary Jo. New Psychic Frontiers. Gerrards Cross, Bucks, Great Britain: Colin Smythe, 1975. Barbanell, Maurice. Spiritualism Today. London: Herbert Jenkins, 1969.